Ok ladies I dedicate this story to you. Not only do I want to inform you ALL about hair extensions, but I want to save you from a potential hair disaster or embarrassing moment! Truth be told, some hair extensions can be damaging to your hair, but the fault may not all be on your hairstylist. When you get extensions, you must commit to really nurturing your new hair and caring for it. If you don’t, that’s when you can have some disastrous effects. If you are considering adding length to your hair, but aren’t ready for the commitment of hair extensions, clip- in’s may be the perfect solution for you. Clip-in hair pieces can be purchased at most wig stores, and some beauty supply stores. They are perfect for someone who only wants to add volume and length occasionally, like on the weekends, or for an event. WEAR CLIP-IN’S WITH CAUTION! You can’t sleep or swim with them, so save yourself the embarrassment and don’t wear them when trying to do either. I’ve seen clip-in pieces on the floor at a club, in the bathroom at a restaurant, in the pool in Las Vegas.. yup. NOTE: Be sure your clip-in’s match your own hair! 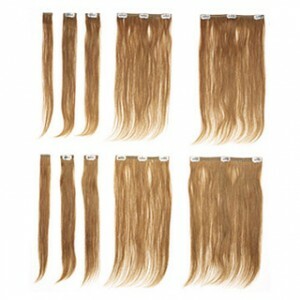 I see it ALL the time… a girl with light brown hair with lots of gold highlights, wearing bleach blonde clip-in pieces. It looks so unnatural and is screaming FAKE! 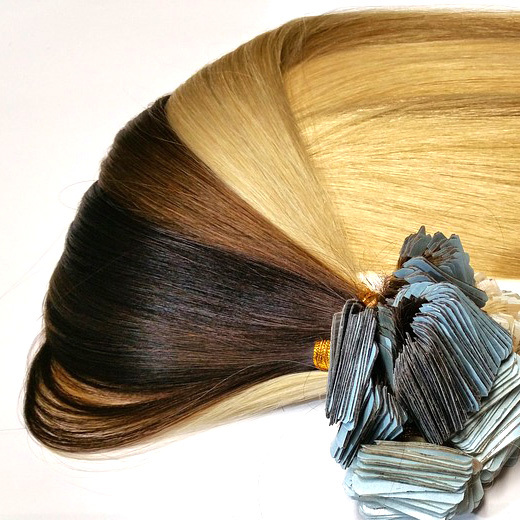 If you have different tones of color in your hair, then your clip-in’s must have different tones too. There are many different types of extensions, all different price ranges and qualities, and I encourage you to do some homework and shop around to find a method and a hairstylist that seems best for you. I get emails daily with the same question over and over, “How much do hair extensions cost?” Though I understand this is a very important question that needs to be answered, it’s not as simple as that. Price varies depending on many things, and you need to learn all about them to better understand where your money is going. Kim’s Hair Extensions Are Flawless! Generally your biggest investment when getting hair extensions is the hair. If the hair is really cheap, then it probably won’t last very long, and you will have to replace it frequently. The better the quality, the longer it will last. If the hair is expensive, then that means it definitely should last you a long time. If a stylist is charging you $2500 for extensions, and says you have to replace the hair every few months, then she is ripping you off. Hair that is that price should last you up to a year. Once you have hair extensions installed in your hair, you will need them to be “maintenanced” every few months. This means as your own hair grows, so do the extensions, and after about 2 months it’s time to move the extensions back up to your scalp. This is an additional service so it’s important to consider this when investing in hair extensions. As for the types of hair extensions, there are many, and I don’t want to bash any one type in particular. My belief is if you trust your hairstylist, have seen their portfolio of hair extension work, and feel confident in them, then go for it! Everyone has their own personal preference, and whatever works best for you works best for you. I always encourage clients to come in to my salon to meet me, see the extensions I have in my own head, feel them, and I’ll even put one extension in their own hair so they can see how it’s done and feel it for themselves. ALWAYS SCHEDULE A CONSULTATION BEFORE GETTING HAIR EXTENSIONS! This is a must, and I won’t even order hair until consulting with my client. It’s not like you’re getting plastic surgery or permanently changing your life forever, however extensions aren’t cheap, and you need to feel good about your new hair awaiting you! 1. Am I a good candidate for hair extensions? You need to be sure that your hair can even handle hair extensions. Bad candidates include: someone losing their hair, someone whose hair is too short for installation, someone with severely damaged hair. 2. How long will the hair last? 3. What will the maintenance be? Depending on the method of extensions, they do require some maintenance. As your own hair grows, so do the extensions, and you need to be informed how often you will be sitting in your stylists chair and what the cost of this service is. 4. What is the potential damage of the hair extensions they offer? Your stylist should be able to answer this quickly and honestly. And if they have extensions, they should show you the condition of their own hair. If you have a well experienced stylist with a great reputation for doing hair extensions, and you care for your hair as you are told to, your hair will be fine and you shouldn’t be in fear of damage. But be sure they make you feel comfortable in this and find a way to prove to you are you are in good hands. 5. What does the initial cost include? Are there any hidden charges? Once hair extensions are installed you will need a “blending” haircut to finish off the service. I include this in my service charge, but I have had a stylist sniper in that additional charge on me, without me realizing it wasn’t included in the price ( unfortunately even though I do extensions, I can’t do my own!). My philosophy is if you are my client, I will take care of you, and if there is ever going to be an additional charge for a service offered, you will be informed of that. Just look out for yourself, that’s all! J Lo’s Extensions Are Fab!